The Queensland Government recognises that a significant number of people do not speak English well enough or are not able to communicate adequately with Queensland Government staff and Queensland Government funded non-government organisations. The Queensland Government Language Services Policy states that clients should be provided with fair and equitable access to services that are responsive and high quality. Queensland Health implements this policy by ensuring staff act on the obligation to provide effective, efficient and inclusive services through appropriate use of interpreters for people that are not proficient in English. Interpreters can be provided in person, over the phone or via video conference. The Queensland Health Working with Interpreter Guidelines state that a professional interpreter should be engaged when the information to be communicated to the patient is significant for health and/or health outcomes and the person’s English skills are assessed to be inadequate to properly understand the situation or the instructions they are being given, the person has a Queensland Government interpreter card, or if the person requests an interpreter. 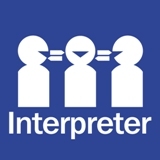 The guidelines explain that friends and family members should be used only in emergency situations when an interpreter is unavailable, and that people below the age of 18 are not to be used as interpreters under any circumstances. If possible, clients should request interpreters in advance.